Kozuki Mai is an elementary student who wants to be a magician and perform in her family's "Magicarat" magical act. However, she is too young, and her magic skills are not very good. Then one day, she encounters a ball of light that was put into a stuffed doll of flying squirrel, bringing it to life and somehow giving her the power to turn in to the 18 year-old magician "Magical Emi." 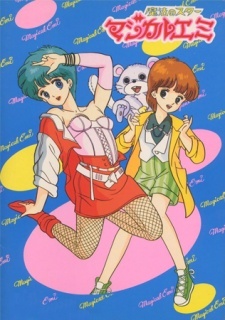 As Emi, Mai was able to join the magic act. But she must keep her identity a secret from her family and from her crush. Watch Mahou no Star Magical Emi Episodes Online at Animegg.org. Mahou no Star Magical Emi is available in High Definition only through Animegg.org. Choose an episode below and start watching Mahou no Star Magical Emi in Subbed & Dubbed HD now. Mahou no Star Magical Emi 10Highland Train - Where is the UFO? Mahou no Star Magical Emi 9I hate boxing!